At Steam Master Carpet & Upholstery Cleaning, Inc. we are often asked, “What is the best method for cleaning carpets?” From our experience, the best method for cleaning carpets for both residential and commercial properties is steam cleaning. 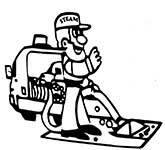 Steam cleaning is a hot water extraction method that deep cleans your carpeting investment. Carpet may not be the first thing that comes to your mind when you think of investments in your home or commercial space, but it is. Your carpet can last you a very long time if properly taken care of and maintained. That is why we recommend steam cleaning your carpets at least once every 12 months. “But isn’t vacuuming enough?” No, because a vacuum only picks up loose particles on the top layer of your carpet. While it is important to vacuum regularly a vacuum cannot clean as deep as the steam cleaning method. Let’s look at the process of how steam cleaning works to get a better idea of why it is best. When you book a cleaning session with Steam Master Carpet & Upholstery Cleaning, Inc. one of our IICRC-certified technicians will first evaluate your carpet to determine the best treatment that your carpet needs. The technician will then apply a pre-conditioner to your carpet to begin to loosen the soil and residues from the fibers deep within and bring them to the surface. Following this, the steam cleaning process begins. During the process of steam cleaning, no actual steam is used. Instead, our powerful machines inject a hot water and detergent solution into your carpet under high pressure via the latest equipment our industry offers. The high pressure produced flushes out the soil and residues from the carpet fibers. This then produces what we call a “dirty solution” that must be removed. Simultaneously, as the high pressure loosens the dirt our high-powered wet vacuum pulls up the “dirty solution” and collects it for disposal in a tank. This leaves your carpets fresh and clean! Steam cleaning is perfect for moderate to heavily soiled carpets for both residential and commercial carpets alike. It will save you money in the long run because it will extend the life and appearance of your carpeting investment. Cleaning using this method also improves indoor air quality. Over time the fibers in carpet become an ideal breeding ground for allergens and bacteria. Especially if pets and children are often within the space. Spills, stains, and dander, as well as other particles, quickly produce unpleasant smells and make your carpets unsightly. However, steam cleaning can get out the worst stains, smells, and allergens that vacuuming fails to do. We strive to offer you the best services in our industry to maintain the look of your carpet and improve the quality of your home and workspaces. Our technicians are IICRC-certified and they perform steam cleaning services daily. Although, steam cleaning appears it can easily be a DIY project it takes a professional to clean your carpets properly. We offer the best equipment that our industry offers which is stronger than consumer rentals that may not be serviced correctly. Rentals could malfunction, put out too much water or detergent, and they do not dry fibers as much as our machines do. Being IICRC-certified our technicians perform all tasks to national standards and understand how to tackle even the most difficult of problems. Steam Master Carpet & Upholstery Cleaning, Inc. offers quality and affordable rates to meet everyone’s needs. Contact us today and let us remove the dirt for you!